This is where you will find latest news about activities and initiatives Two Rivers Housing is involved with. Our press releases and other news items are published here. There’s an events calendar showing you the various meetings and activities taking place, from tenant group meetings and IT training courses to drop-in sessions, leisure events and Board meetings. This will be updated throughout the year, so keep an eye on our diary to find out what’s going on. 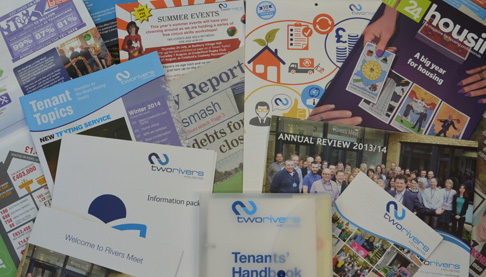 All our information leaflets and annual reports are saved in the ‘Library‘ along with policy documents and previous issues of our tenant newsletter, Tenant Topics. If there’s a document you can’t find that you think should be here try the Search function first (hover over the magnifying glass image right at the top of the page, type in your search information and press ‘return’) and, if you still can’t locate it, please get in touch and we’ll do our best to track it down for you. If you need to contact our Press Office, please send us an email or call Liz on 01531 829262 or Leanne on 01531 829256.